For many people, one of the most severe consequences of the credit crunch has been the rapid asphyxiation of the buy to let market. In recent years buying property with the intention of renting it to tenants has been seen as a guaranteed way of making money. Home owners would borrow against the value of their home, and use the money to purchase a second property. The intention was that the rent paid would cover the mortgage payments and, for the slightly more adventurous investor, would leave something left over with which they could start the whole process again. Buying for the purposes of renting was emblematic of the boom years that we have only just left behind; stories abounded of middle-income wannabe investors hitting property gold within a matter of months. Buy to let is, if not dead, certainly out for the count. The credit crunch has heralded the end for thousands of amateur investors caught out either by their own naivety or circumstances more or less beyond their control. There are a number of reasons for this. In the first instance, the rising cost of credit has meant that many of those who were previously perfectly solvent are now finding it impossible to pay mortgages on one home, let alone two. At the same time, as unemployment has risen along with inflation, many individuals are moving out of the desirable areas that had formed the bedrock of the buy to let industry. Furthermore, as property prices spiral downwards, buy to let investors find themselves with insufficient assets against which to guarantee the loans that they need. This has been exacerbated by the failure of Bradford and Bingley, which had carved out a niche for itself as the buy to let mortgage lender of choice, under the name Mortgage Express. Without the friendly rates offered by B&B, even those lucky enough to be accepted for a mortgage are unlikely to be able to afford it, with rates frequently several points above base. Times are gloomy for many buy to let investors; indeed, some of those that had inspired legions of blindly optimistic prospective property tycoons are now throwing in the towel. Essentially, the promise of continued property price rises, upon which the whole venture was tentatively balanced, has not been honoured. 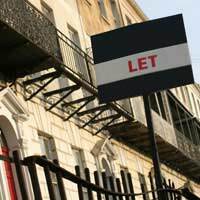 However, some analysts suggest that all is not lost for buy to let. For those with money to spend, there is the potential to pick up a bargain. Similarly, while house prices fall, the credit crunch hasn't affected the rental market in nearly the same way. Rental prices are holding up relatively well, meaning that buy to let investors may yet be able to salvage the situation. If you can pick up property cheaply and can secure an interest only mortgage, you can probably expect to see annual returns of around 5 to 6%. Clearly these aren't the giddy heights that we have previously seen, but canny investors have the potential power to turn the buy to let disaster around.